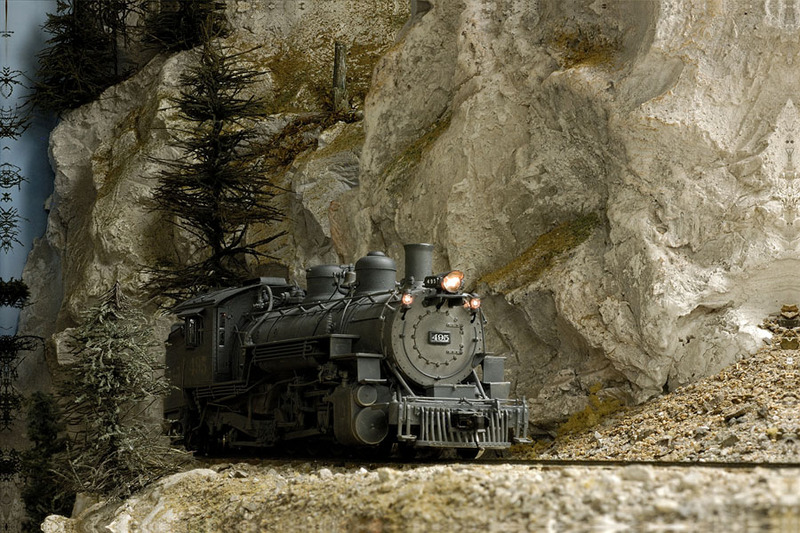 A much more detailed version of this article appeared in the October 2012 issue of Railroad Model Craftsman magazine. This shorter version should give you a brief destription of what was covered in the printed article. 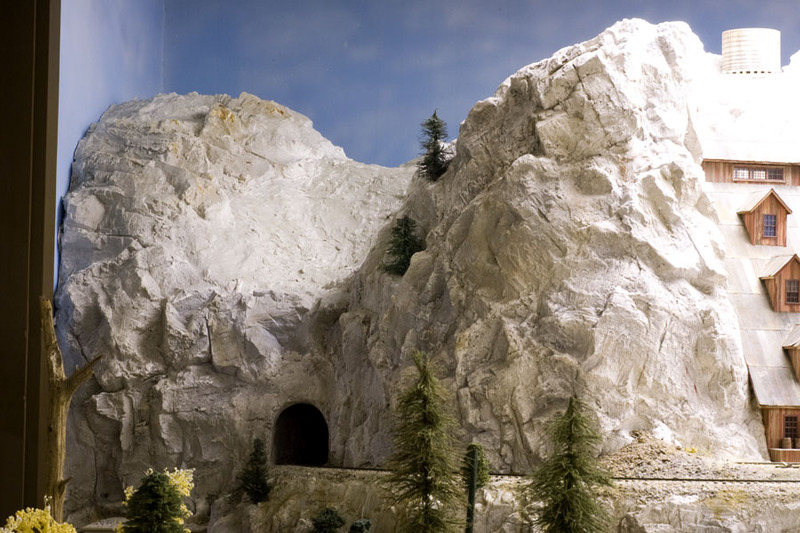 When plaster scenery was completed in one area of the, "Cimarron & Tall Timbers RR," over a decade ago, my plans were to create a summer scene of an avalanche or snow slide that occurred over the past winter season. 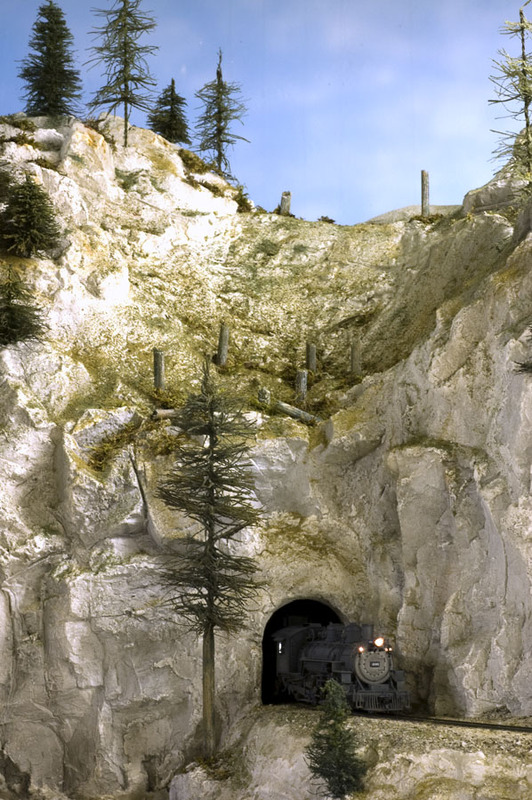 Rock castings were placed along both the left and right sides of the smooth, center slide area where trees would have been broken off by the force of avalanches. Trees and shrubs would be growing along both sides because they would have been missed by the brunt of the downward rushing snow and rocks. The primary concern was hiding the dark seam formed where the rock castings butted up against the sky-blue painted wall. I planned to place pieces of Sphagnum moss, ground foam and bottle brush and furnace filter trees along that seam would do the trick. 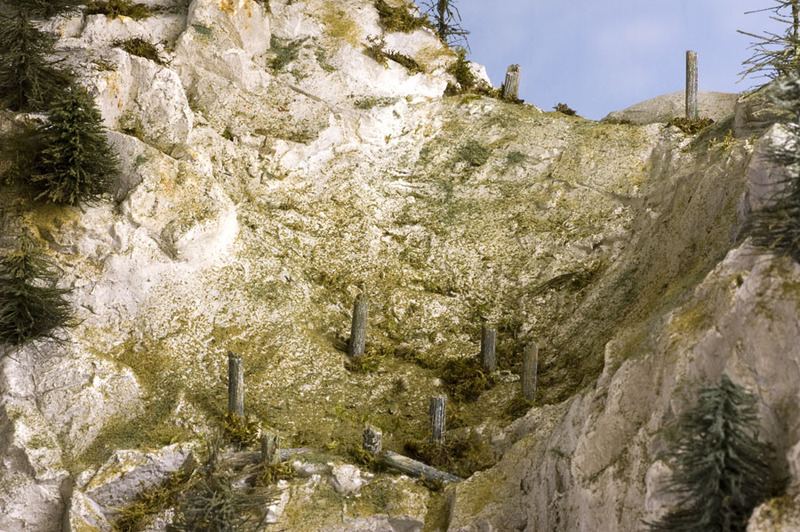 The bottle brush trees were made on a tree making machine and planted along the left edge of the scene where plaster met the wall. 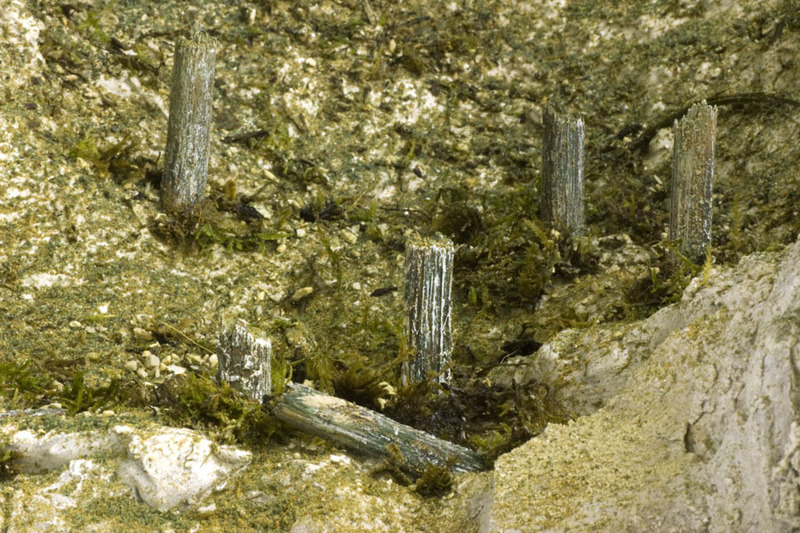 Sphagnum moss and Woodland Scenics ground foam were planted atop the rock castings on both sides of the slide area. I constantly stepped back to review the progress, adding additional trees, foam and moss pieces until the scenery/wall seam disappeared. The broken tree trunks were made from cedar shake shingles removed from a full sized house in our neighborhood. The tree bark effect was created with a wood rasp, then the trunks were painted with green, gray and black craft paints and finished with a brushing of an alcohol and shoe dye solution. All throughout the scene building process, I continued to add and remove both the bottle brush and furnace filter trees around to positions that would force visitors to look at the scene from a certain angle or position. 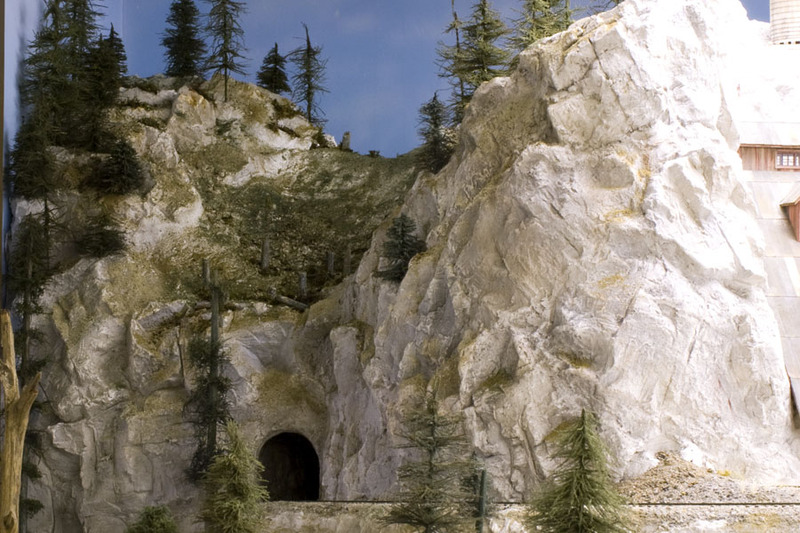 The trees on the upper reaches of the mountain are scrawny and small, compared to those used on the lower portion of the scene to represent the high altitude of the site. 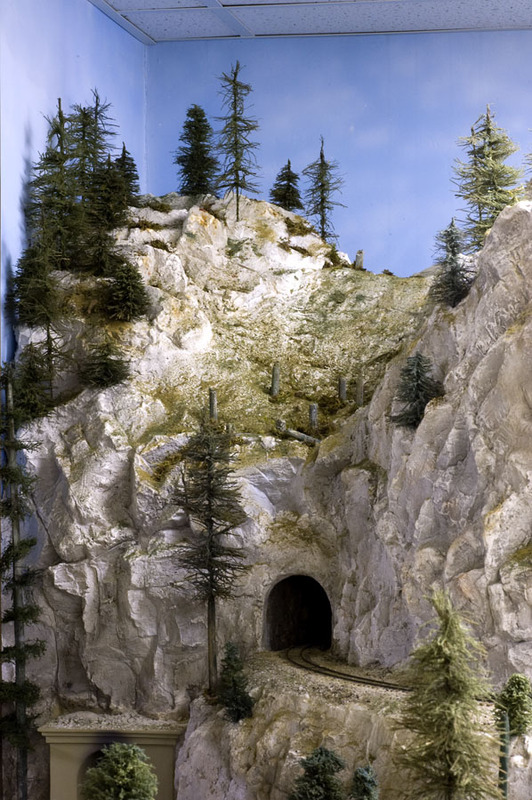 This scene is close to the, "tree line," on my mountain railroad. I placed broken pieces of tree trunks against the stubs of tree trunks in the slide area to represent debris carried downhill by the rushing show and rocks from previous winter seasons. 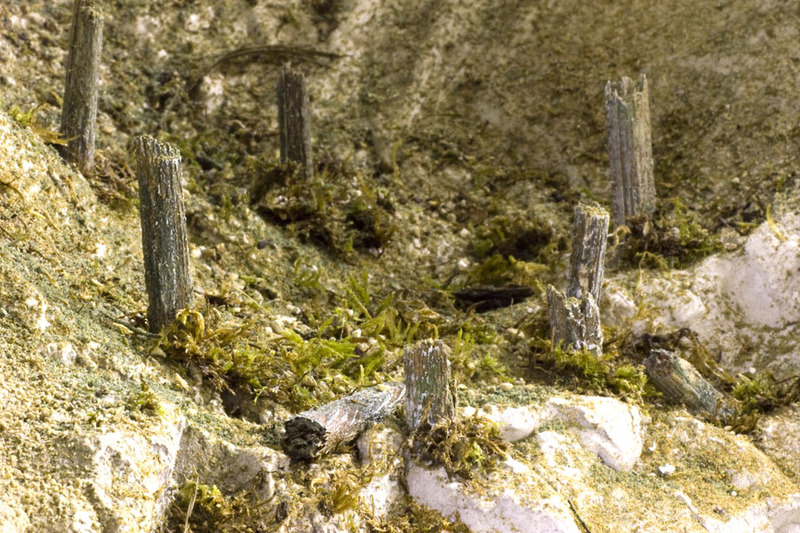 Instead of using the traditional white glue or matte medium, "Floetrol," a liquid that is mixed with paint to make it brush or spray easier and Glidden's, GUN-9013, "Flat Base 3," "deep tint base," latex paint were used to secure the Sphagnum moss and ground foam materials to the plaster scenery. on the upper level of the layout.